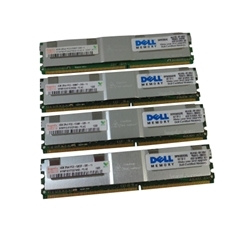 Description: New Server 16GB (4 x 4 GB) memory module set. 667MHz PC2-5300 DDR2 SDRAM ECC 240-PIN DIMM. Memory appearance may vary from picture depending on availability. Dell PowerEdge 1900, 1950, 2900, 2950, R900. Dell Precision 490, 690, T5400, T7400. HP Proliant DL140 G3, DL360 G5, DL380 GS. HP XW6400, XW6600, XW8400, XW8600 Workstation.